The setting of the novel adds to the mood Oe creates, with the Nedokoro’s hometown being a valley completely surrounded by a dark, menacing forest. The approaching winter, and the promise (or threat) of heavy snow which it brings, along with the damaged bridge cutting off the only road in or out of the village, heighten this sense of isolation, mirroring the feelings of the main characters, each of whom is trying to come to terms with their own issues, in their own way. Events naturally build to a climax, but the reader is never sure exactly what that climax will bring. From the very first page, two things were very clear to me. 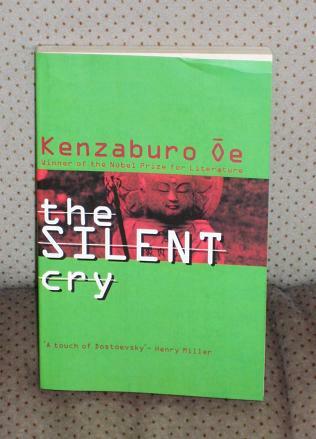 Firstly, that I was going to like this book (just as with Paul Auster’s The New York Trilogy, which I read recently, I was sucked straight into the writer’s world); secondly, that the Oe influence on Haruki Murakami which I had read a little about was clearly evident. From Mitsu’s very first action of getting up, going out to the garden, and descending into a hole, Murakami fans are in very familiar territory. Murakami influences aside, this is a book which demands to be read and reread, which I’ll no doubt be doing at some point, especially as I don’t think I paid this book the attention it deserves. It took me a week to get through it, mainly because of the demands of starting a new job (and looking after an unexpected visitor from overseas! ), and that was too long for me. If I’d read this in three or four days, as I had expected to, I suspect that the narrative would have flowed a lot better, and the mood Oe created would have held up more; the start-stop approach meant that I often took time to get back into the book when picking it up again. I must ead Oe's The Silent Cry. Thanks for the excellent review. Since he influenced Murakami, I am doubly interested! Oe's story seems to always involved two men. I read Changeling and felt lukewarm about it. This sounds like a good read and thanks for selling it so well. I'm half way through Quicksand and wonder where it is leading to. I'll be interested to know whose year 2011 is going to be! I want to read this, but of course that means an inter-library loan. The lack of Japanese lit at my local libraries is baffling. I want to read Murakami's influences. One of these days I want to read Japanese literature. I love anime. So I figure I'd probably love Japanese literature too. For some reason this book never really appealed to me before but now I'm actually looking forward to reading it in April. Thanks! I hadn't realized somehow that Murakami was a big Oe fan, so seeing his early influences is definitely another selling point. BTW, I loved Auster's The New York Trilogy. Speaking of Murakami, Auster's stuff tends to remind me of Murakami too (Ok, I've only read 2 of Auster's books so far, but still). That's not just me, is it? I also picked up on the similarities with Auster in my review of 'The New York Trilogy', but I'm not sure who influenced who (actually, I think they're contemporaries…). Perhaps they're both just very influenced by Kafka! just going back over your Oe posts as I'm currently loving 'The Day He Himself Will Wipe My Tears Away', which I'm reading thanks to January in Japan. It has sat on my shelves for years. Thanks for the push! Séamus – Oe is the one big Japanese writer I've criminally neglected, mainly for the silliest of reasons (his books tend to be a few dollars more expensive than other J-Lit writers, so I never quite get around to choosing them…). Yes, Tony, that's the second story. They are called 'short novels' but the first is 110pages, Prize Stock 60pages and the next two 50pages & 40pages. The last three hardly qualify as novels. The writing is powerful, though.